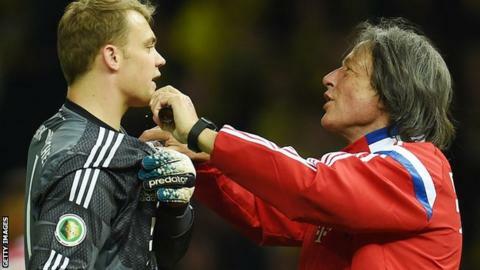 Bayern Munich doctor Hans-Wilhelm Muller-Wohlfahrt has resigned after 38 years in the role, claiming the club's medical department was blamed for the Champions League defeat by Porto. Bayern were missing several key players for Tuesday's 3-1 loss in Portugal. Muller-Wohlfahrt, 72, said: "For unexplained reasons, it was the medical department that was chiefly blamed for the defeat." He added that "the relationship of trust has been permanently damaged". Wingers Franck Ribery and Arjen Robben, midfielder Bastian Schweinsteiger and defender David Alaba all missed Tuesday's quarter-final first leg because of injuries. Coach Pep Guardiola had queried why France international Ribery remains sidelined with an ankle injury he sustained on 11 March and was only expected to keep him out for a few days. Muller-Wohlfahrt, who has also worked as Germany's national team doctor, has previously treated some of the world's leading sportspeople, including six-time Olympic champion Usain Bolt. Champions Bayern are 10 points clear at the top of the Bundesliga and will face Borussia Dortmund in the German Cup semi-finals.